We may all know what a patchwork quilt is, even if we each hold a slightly different impression in our mind’s eye. But what is a patchwork life? A Patchwork Life is one made up of different parts of one’s self, all sewn together. Memories, dreams and personal experiences are fused to make something unique. Like pieces of fabric in a richly patterned quilt, each part of one’s self holds its own special place in the overall picture, giving completeness to the whole. Some patchwork squares are old and have strong memories attached, like a scrap of fabric taken from a child’s blanket or favourite item of clothing. Others are new and exciting, bringing a sense of adventure. Sometimes the colours blend harmoniously to create a sense of calm. Sometimes the patches fray, the stitching unravels and the squares no longer seem to fit. Together, all the different pieces tell the story of who we are. We all have a unique tale to tell and each of us is our own expert storyteller. No one knows your story quite like you. The images comprising A Patchwork Life are designed to evoke a rich array of narrative possibilities. They exude a dream-like quality to foster journeys through the familiar and imagined. The images are visual building blocks: tools to help you describe your own patchwork life. 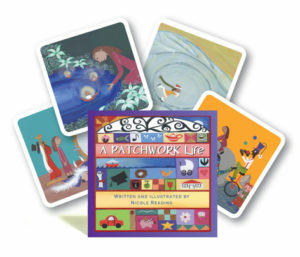 The card set A Patchwork Life and stickers can be used together or separately for storytelling and reflecting on our values and personal beliefs. Like the pieces of fabric in a quilt, the cards that make up A Patchwork Life can be laid out to build an impression of how life is looking. They provide a starting point for reflection and discussion, whether with yourself or another person. The cards can be chosen to tell a story about a particular issue, or you might select cards that relate to thoughts, feelings or body sensations of the moment. Spread the cards and chose one at random to begin a new conversation. Where does the image take you? Gradually select additional cards to flesh out the details or represent experiences—they can be laid out in any number or in any pattern to help you tell your story. When you feel the story is sufficiently complete, you can start to ask the key questions. Looking at the cards, what appears to be most important to you? How do they reflect your values or beliefs? Do you feel comfortable with the story laid out in front of you? Is it the one you meant to explore? See if you can keep adding in more cards until they stretch out in front of you like a patchwork quilt. Step back and survey the result. What is it like looking at your story laid out like this? What impressions are you left with? Is there anything missing? 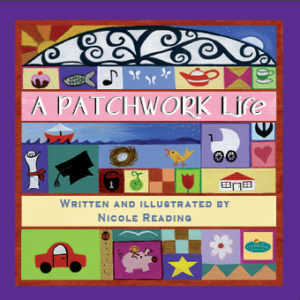 A Patchwork Life may be used to relate experiences, create stories about our personal potential, assist us to consider our options, and make decisions. While initially developed for use by counsellors and other human service professionals, it is also an ideal tool for individuals seeking to narrate their own private life conversations and stretch the bounds of their own creativity.